If and when IBF superflyweight champion Jerwin Ancajas faces WBC counterpart Srisaket Sor Rungvisai in a unification title showdown, the Filipino said the other day it won’t be difficult to connect because the plodding Thai is slow, making for an easy target. 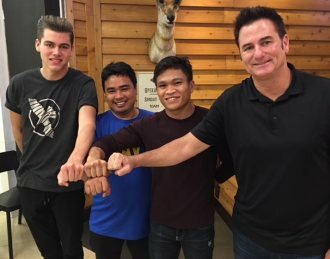 Ancajas, trainer Joven Jimenez, matchmaker Sean Gibbons and Gibbons’ son Brendan were at ringside in Bangkok recently to watch Rungvisai’s defense against Mexican Iran Diaz. After Rungvisai was declared the winner by unanimous decision, Ancajas entered the ring to congratulate the Thai and slung the IBF belt on his shoulder. Rungvisai looked Ancajas in the eye but didn’t say a word. Gibbons said he has initiated talks with Rungvisai’s manager Thanchai Pisitwuttinan on the possibility of a duel between the southpaws in the US in February. The WBC has delayed Rungvisai’s mandatory fight against Mexico’s Juan Francisco Estrada to allow for one more voluntary defense, paving the way for the championship unification. The WBC’s condition, however, is after the next voluntary defense, the winner must face Estrada. Gibbons said he will try to arrange a fight for Estrada in the undercard. That means working it out with Top Rank which promotes Ancajas and Zanfer, the Mexican company that represents Estrada. The superflyweight division has been gaining media mileage lately with the emergence of exciting contenders to challenge the champions. A main event featuring Ancajas against Rungvisai with Estrada in the undercard is a potential blockbuster. Jimenez said during his Bangkok visit, Ancajas was invited by Thai promoter Jimmy Chaichatchuang to share his story with Thai fighters under his care. Chaichatchuang asked Ancajas to relate how discipline, hard work and dedication led him to a world title. The Thai promoter wanted Ancajas to inspire the fighters who were disappointed with the downturn in former IBF flyweight champion Amnat Ruenroeng’s career. Amnat, a Chaichatchuang protégé, represented Thailand at the 2008 Olympics, turned pro, became a world champion, returned to the 2016 Olympics and has taken to the bottle with his career at an ebb. Jimenez said Rungvisai is tailor-fit for Ancajas. “Malaking chance ni Jerwin manalo kasi madaling tamaan si Rungvisai,” he said. “Paghahandaan dami siya.” For Ancajas, it will be his last fight at superflyweight as he plans to move up to 118 pounds. Last month, Ancajas was held to a split 12-round draw by Mexican challenger Alejandro Santiago in the sixth defense of his IBF belt. He complained of cramps starting the fifth round and pain in his right hamstring hampered his ability to execute his offense. Ancajas, however, refused to make it an excuse for failing to win. A week before the weigh-in for the Santiago fight, Ancajas was five over the 115-pound limit. He was within a fraction of the limit two days before the weigh-in. In previous fights, he was 10 over the limit a week before and made weight just in time for the weigh-in. Ancajas wanted to make sure he wouldn’t go overweight for Santiago but paid the price for it as his body was drained early and couldn’t recover or rehydrate for the fight. Ancajas said weight wouldn’t be a problem if he jumps to the bantamweight division but there is one more mission to accomplish----beat Rungvisai to unify the 115-pound title. Photo: IBF superflyweight champion Jerwin Ancajas (third from left) with trainer Joven Jimenez, matchmaker Sean Gibbons and Gibbons’ son Brendan.